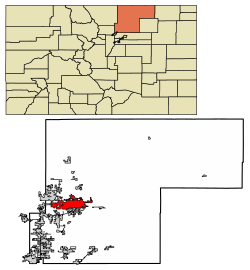 Greeley is the home rule municipality that is the county seat and the most populous municipality of Weld County, Colorado, United States. 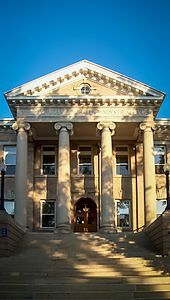 Greeley is in northern Colorado and is situated 49 miles (79 km) north-northeast of the Colorado State Capitol in Denver. According to a July 2015 estimate by the U.S. Census Bureau, the population of the city is 100,883,  and a 2014 population estimate made Greeley the 12th-most populous city in Colorado. Greeley is a major city of the Front Range Urban Corridor. Greeley was built on farming and agriculture, but kept up with most modern technologies as they grew. Telephones were in town by 1883 with electric lights downtown by 1886. Automobiles were on the roads alongside horse drawn buggies by 1910. KFKA became one of the first radio stations to broadcast in the US in 1922  and the Greeley Municipal Airport was built in 1928. Greeley housed two POW camps in 1943,  during World War II. One was for German POWs and the other was for Italian POWs. A vote to allow the sale of alcohol passed by a mere 477 votes in 1969,  thus ending temperance in the city. The Greeley Philharmonic Orchestra was started in 1911. In 1958, Greeley became the first city to have a Department of Culture. Greeley is still growing and changing today; its population has more than doubled since 1970. As of the 2010 census,  there were 92,889 people, 33,427 households, and 21,250 families residing in the city. The age distribution shows 68,936 residents are age 18 and older and 23,953 residents are under 18 years of age. The age distribution of the population showed 31.3% from 0 to 19, 11.4% from 20 to 24, 25.4% from 25 to 44, 21.1% from 45 to 64, and 10.7% ages 65+. The median age was 30.5 years old. The gender distribution was 49.1% male and 50.9% female. For every 100 females, there were 96.6 males. For every 100 females age 18 and over, there were 93.9 males. Poudre Valley Health Systems merged with University of Colorado Health in 2011 resulting in new and improved healthcare facilities all around Colorado. A brand-new 153,300 foot hospital in West Greeley is set to open in Spring of 2019. The UCH faciltiy will provide Greeley residents with an additional option for inpatient healthcare services rather than only NCMC and is conveniently located off of Highway 34.